In today’s fast-paced world, many of us find ourselves struggling to keep up with all the responsibilities at work and at home. From the long hours you spend in the office, to preparing meals for the kids, helping them with their homeworks, and managing cleaning chores and other household duties. When things get busy, one of the chores that typically gets left out is house cleaning. It tends to drop down to the bottom of your daily to-do list because let’s face it, what is more important than cooking meals for the family and sending the kids to school, right? What many of us don’t realize is that delaying the task only makes it more of a hassle when you finally decide to do it. Instead of doing small chores daily, we are overwhelmed to find one week’s worth of dirty clothes, grimy surfaces, and dusty blinds. If you have a busy lifestyle that prevents you from doing a regular cleaning of the house, then you have probably considered hiring the services of professional cleaners at some point. Outsourcing the cleaning can help you maintain an organized place, and let you have more control of your time. But why do so many homeowners choose to take on the cleaning tasks on their own? It is because a lot of people still think of professional maid services as a luxury that they can do without. But if we were being honest, we would admit that cleaning the house is the furthest thing from our minds after a busy day at work. Will you still have time or energy to scrub the bathroom floors and clean the kitchen appliances after caring for the kids? Long hours spent at the office can lead to tiredness and poor work-life balance. When you spend a huge chunk of your time trying to meet deadlines, and struggling to reserve some energy for when the kids need your help with their homework, you soon find that there is very little time left to do other things. After making dinner, you want nothing more than to relax in bed and recharge your mind and body. If you are constantly sneezing or experiencing runny nose when at home, then you probably have dust allergy that is triggered by dust particles trapped in the air. Getting clean air when you are indoors is not as simple as spraying air fresheners. In fact, may air fresheners contain harmful chemicals that can cause health issues in people with asthma. Setting a regular cleaning appointment for your home will help improve the quality of air that your family breathes. Cleaners are specifically trained to use the appropriate cleaning solutions and cleaning equipment that will trap pollutants and harmful particles such as tobacco smoke, pollen, and dust mites. You may not like cleaning because you know there are other more interesting things you can do. This is okay, and should not be something you are afraid to admit. There is no shortage of homeowners who would rather spend the day doing things they love than vacuuming the living areas and cleaning the bathroom. You don’t have to force yourself to do it, but you can still make your home look presentable by tidying up the night before a cleaning appointment. Having a new baby is an exciting time. It is also time-consuming and exhausting, as you spend many sleepless nights feeding your baby. Simply put, having an infant at home trumps everything, including the task of cleaning the house. Because all your attention is focused on your newborn, it makes sense to leave the cleaning to the experts. Cleaners are trained to remove dirt and to disinfect surfaces to make your home an oasis for you and your newborn. Having people who can take over some of the household chores will also prove to be extremely helpful especially if you are feeling burnt out from being a new parent. Time wasted doing house cleaning is time that you can never get back. If you are someone who recognizes the importance of using time wisely, then you should definitely invest in hiring cleaners. They will take care of the cleaning chores for you, so you can spend time outside of work pursuing your personal goals, working on the side to maximize your earning potential, and spending some more quality time with your family. Maintaining a tidy abode is important for your family’s health and productivity. As they say, “A cluttered house creates a cluttered mind”. This is because a disorganized place makes it harder for you focus your attention on one thing at a time. As such, you want to ensure that clutter is out of sight and that your house will be your refuge rather than an enemy that hinders you from being productive. When you enter a room, the first thing you will notice is the surroundings. If you live in a clutter-free home, you are motivated to get a lot of things done. Compare that with lying down in a living area that is disorderly and full of dirt. You probably would not mind throwing your dirty clothes into that pile of clutter because your home is a mess anyway. This is the difference between an organized space and a cluttered room. The former promotes peace, while the latter creates chaos in your mind and deters you from improving your focus. For people working from home, focus is crucial to completing tasks and meeting deadlines. It can be difficult to get things done efficiently when you are working against a backdrop of clutter. In the back of your mind, you may be calculating the amount of cleaning you have to deal with after your work, and this can cause more distraction than if you had an organized workplace to begin with. The importance of a germ-free home cannot be underestimated. It protects your family from common allergen, allows you to focus and get more things done, and gives you a sanctuary to come home to. 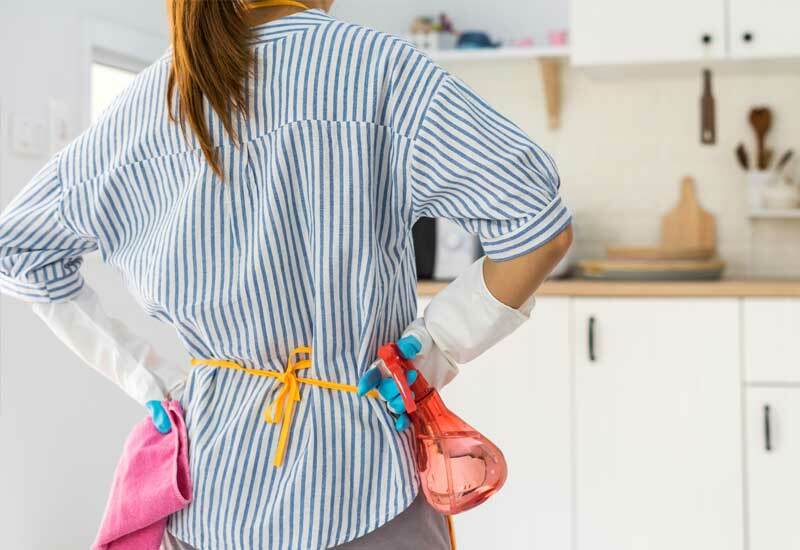 At Pristine Home, we offer a whole range of cleaning services to help you take more control of your time, and to provide you with relief from time-consuming household chores. All you need to do is fill out our quote form and in less than 60 seconds you can be on your way to booking your first home cleaner.